Testimonial from MuggyWeld customer Herman Ginger. Herman, a self-described “novice” welder, welded this cast iron Stover Pump Base with 77 arc rods and a Miller AC/DC 225 amp welder. The part was broken into 5 pieces, so Herman set his welder to 70 amps, tacked the parts together, beveled the weld area, and joined the cast iron pieces with 77 electrode. 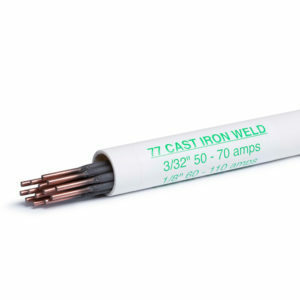 77 can be used on cast iron, cast steel, and mild steel, in any combination, and makes a wonderful TIG rod–without removing the outer coating.